Today I was about to take my three-year-old son out for a walk around 6pm. I took the camera hoping to capture Miramar in some way. As I was walking out the door, my seven-year-old came rushing up to me on his bike, with a few friends in tow. Our friend's house had a major fire, just an hour before. What? I was home at that time and didn't hear anything. 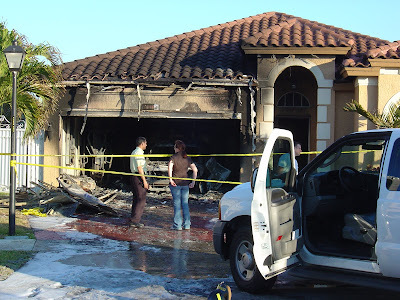 So we walked over, like 20 houses around the corner, and sure enough, a huge fire had destroyed their garage and severely damaged the interior. The owners were there, although their renters were not. Apparently, from what one owner told me, a hot muffler from the renter's car against the wall and a couch was the fire starter. Really sad, and the tears showed it! I drank Grand Marnier in that house with the best of them! But that's why you have insurance. And that's why you live in a city that has the six fire trucks (that I missed) to put out this fire before the whole house was gone. They will recover and no one was hurt. 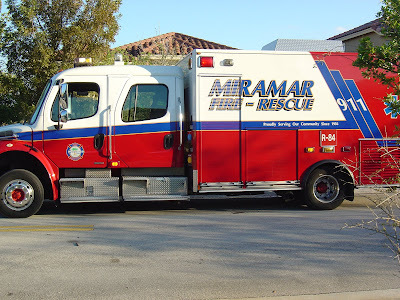 On a weirder note, as the community security guard (and the only one with a gun) told my son and his buddies to go play somewhere else, a Miramar Fire Rescue truck pulled up. But they took their stretcher into a house two doors away. Clearly a corner to avoid today (and the Miami police officer dad of my son's friend who lived across the street thought today might be a moving day). However, it makes you proud of these fire, police and rescue workers. And I am! Here's the truck that came to rescue a neighbor of the fire victim. Here are two more garage pictures. 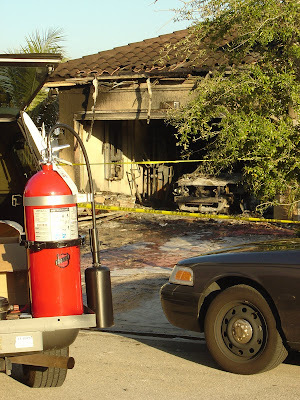 Check out the burned out car inside-that will NOT buff out! The damage was extensive. You'll probably see this one on the news tonight! Wow...you captured the events of that day so well. A day I will never forget. That house two doors down was mine and that stretcher carried out my step-daughter who passed away that same evening. I'm really sad to hear that news about your step daughter. 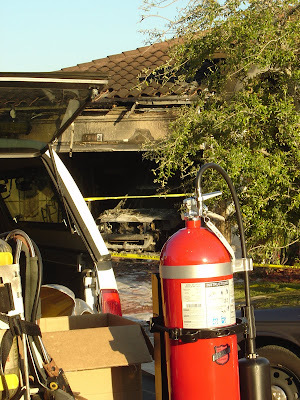 I had no idea, as I really saw nothing from the Fire Rescue vehicle, except its unexpected arrival. I'm not sure if you know the family that owned the burned home, but they are OK. We've spent time with them after the fire. But that day was really sad, and even sadder with your input. I hope you're coping well by now. Nice to meet you. You've probably seen me or my kids around.